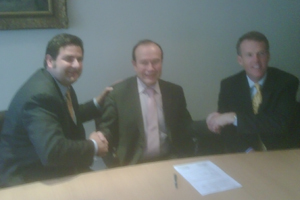 Paris, France, March 5, 2009 -- CIRCOR Aerospace Products, a CIRCOR International (NYSE:CIR) business, has completed the acquisition of Bodet Aero of Chemille, France and is acquiring the related ATLAS Productions of Tangier, Morocco from Groupe BMP. Bodet Aero and ATLAS are leading manufacturers of electro-mechanical and fluidic controls for aerospace, defense and transportation markets and will join Industria, S.A.S. of Paris, France, to increase the CIRCOR Aerospace Group capability in the European market. Bodet Aero has over 20 years of experience in the design and manufacture of specialized aircraft controls system components including aircraft landing gear wheel speed tachometers, flight control pedal transmitters, speed reducers and integrated fluidic and electro-mechanical controls components. ATLAS Productions was formed in 2005 in the Tangiers, Morocco free trade zone and specializes in low cost manufacturing of aerospace components. Bodet Aero and ATLAS products are found on a full range of aerospace platforms, including the Airbus family of commercial aircraft, defense applications and business aviation platforms including the Dassault Falcon 7X. CIRCOR Aerospace is a global leader in the design, manufacture and testing of high reliability, severe service fluid controls, control systems, and integrated landing gear systems. CIRCOR Aerospace has design and manufacturing centers in North America, Europe and Asia, producing aerospace products under the Circle Seal, Aerodyne, Industria, Motor Technology and Loud brand names. Jacques Bodet, President of Bodet Aero, state, "I am pleased to combine my business with Industria and CIRCOR Aerospace and will stay on to lead the business into the future. I believe CIRCOR's aerospace experience and global reach will significantly expand the growth opportunities available to our business." Commenting on the transaction, Chris Celtruda, Group Vice President for CIRCOR Aerospace Products, stated, "We are excited to have the Bodet Aero and ATLAS capabilities as part of the CIRCOR Aerospace team. Our strategy of expanding our electro-mechanical controls product line and continued focus on world class manufacturing make this a great fit for our aerospace business. We look forward to continuing Bodet's long tradition of engineering, manufacturing and service excellence and look forward to the ability to build on the strong Bodet reputation." CIRCOR International is headquartered in Burlington, Massachusetts and the CIRCOR Aerospace Products group is headquartered in Corona, California. Industria S.A.S. is a wholly-owned France based subsidiary of the CIRCOR Aerospace Group. EuroConsult Inc. acted as financial adviser to CIRCOR on this transaction, and Financiere MP acted as exclusive adviser to BMP. Also, White and Case acted as legal counsel to BMP and CMS Bureau Francis Lefebvre as legal counsel to CIRCOR. This press release contains forward-looking statements withing the meaning of Section 27A of the Securities Act of 1933, as amended, and Section 21E of the Securities Exchange Act of 1934, as amended. Reliance should not be placed on forward-looking statements because they involve unknown risks, uncertainties and other factors, which are, in some cases, beyond the control of CIRCOR. These statements include, but are not limited to, the Company's expectations related to the integration and performance of the Bodet Aero acquisition. Actual events, performance or results could differ materially from the anticipated events, performance or results expressed or implied by such forward-looking statements. BEFORE MAKING ANY INVESTMENT DECISIONS REGARDING OUR COMPANY, WE STRONGLY ADVISE YOU TO READ THE SECTION ENTITLED "RISK FACTORS" IN OUR MOST RECENT ANNUAL REPORT ON FORM 10-K, WHICH CAN BE ADDRESSED UNDER THE "INVESTORS" LINK OF OUR WEBSITE AT WWW.CIRCOR.COM. We understake no obligation to publicly update or revise any forward-looking statement, whether as a result of new information, future events or otherwise.